Roxys is known for its Cheesecake. While at the Blogger Social 2008 we had a meetup at Roxys with Geoff Livingston, Jane Quigley, Jason Falls, Suki Fuller. 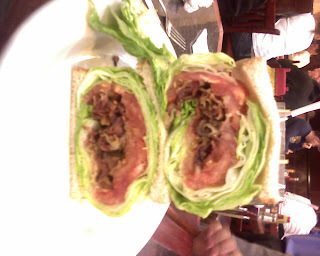 I ordered the BLT and its so massive and bread forms a minor part of the sandwich. Nobody could help me finish this. I would not recommend it to anyone. This photo leaves me questioning the true enormity of this sandwich, sir. I demand more evidence! I would avoid it the next time.